In a follow-up on the rabies outbreak in Sarawak, Malaysia, The Ministry of Health Malaysia (MOH) is reporting an additional human rabies case 49-year-old farmer from Sri Aman Division. According to health officials, he was bitten by his dog in January 2018 and did not seek treatment afterwards. On August 11, 2018, he was hospitalized at Serian Hospital for fever and shortness of breath. In the ward, patients show signs of hydrophobia and weakness. The patient was then referred to the Sarawak General Hospital on August 14, 2018. He is currently treated at the Infectious Disease Ward and is in critical condition. The pet dog died a week after the bite. However, no confirmation can be made for the cause of the dog’s death. The dog bit a resident of the same village in January 2018. The bite has been identified and has been given an anti-rabies vaccine on August 16, 2018. He is in good health and will be monitored by the State Health Department (JKN) for a period of six months. 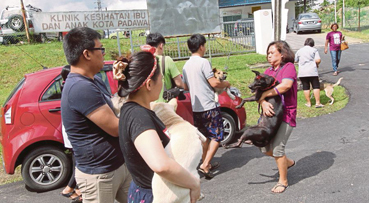 With this latest confirmation, the number of rabies cases among people in Sarawak since the declaration of the outbreak on 30 June 2017 until 16 August 2018 is 12 cases; in which 10 cases have died, one case (1) home-treated case with neurological complications and one (1) recent case is still under treatment.